Who doesn't love a good burrito? And one that's only $6?! Get out of here—you can't even buy a smoothie in Bend for $6! Well, at any of Parrilla's locations you can get that burrito. A mere $6 gets you a Classic Burrito with cilantro lime rice, black or pinto beans, cheese, sour cream and salsa with your choice of protein. For $6 you could also get three tacos! And if that wasn't enough, Parrilla still sells Pabst Blue Ribbon pounders for a buck. Owner Jeff Dearing said his least favorite thing to do is to raise prices. "We offer quality food made from scratch at an affordable price," Dearing said. Dearing said what sets his restaurant apart from the competition is its commitment to using better quality products and better ingredients, including having all-organic proteins for customers to enjoy. 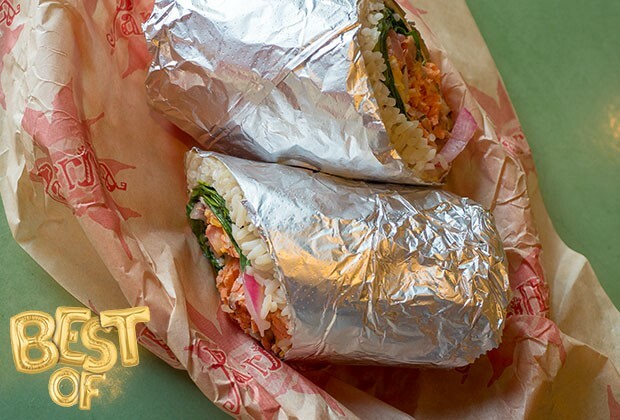 Most of the menu items are around $8, with the most expensive one being the $10 Smoke This Wrap—smoked wild salmon served with cilantro lime rice, spinach, pickled red onions, chive cream cheese smear and recommended with cheese, mild salsa and herb aioli. Parrilla also has an inexpensive kids' menu with a Bambino Bean and Cheese Burrito for $3 or the Lil' Alfie, Fettuccini noodles with house Alfredo sauce served in a 10-inch tortilla for only 4 bones. After 18 years in the biz, Dearing said it's still a thrill to be recognized by the community.